Why I became a Sweet Feet member: To help educate people about running and the national benefits of sweet potatoes. Favorite Race: Tuna Run 200 because of the comradery and wild times. This is a 200 miles race from Raleigh to the coast. 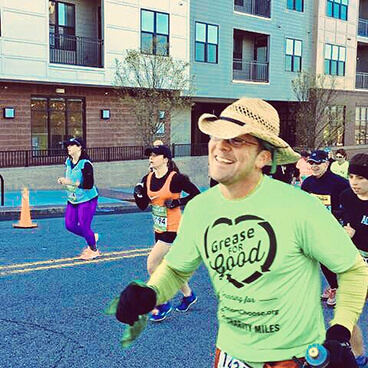 What got me running: Friends challenged me and I wanted and a way to see what I’m made of. A little about me: I’m a husband and father of 3 who am originally from the Buckeye state. I have been a Biodiesel ambassador/ Entrepreneur for the past 8 years. I really got into running about 10 years ago after rehabbing back from a ruptured Achilles tendon. Around this time I found the book “Born to run” and I was hooked.